Further increase the elegance of your outdoor canopy by adding our sliding glass doors to your Camargue®. These completely transparent sliding walls not only look stunning, but also protects you from weather and wind and your terrace covering can now be completely enclosed. As you would expect from the RENSON® range of products, special attention to the easy installation and perfect integration is all in hand. 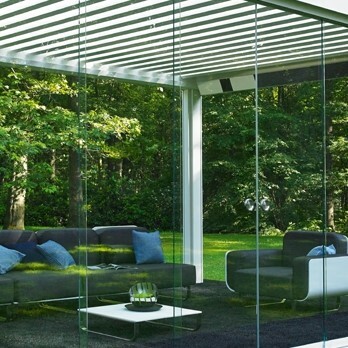 The glass sliding doors can also still be combined with the Fixscreen® Blinds should you also require sun protection. Sliding Glass Doors can be fitted on both the span and pivot sides of the Camargue®. You can opt for designing glass doors on just 1 side or all 4 - the choice is yours! On sides less than 3750mm, the glass panels will be set to open to the left or right. Over 3750mm, the glass panels will open from the middle and glide to the both sides.